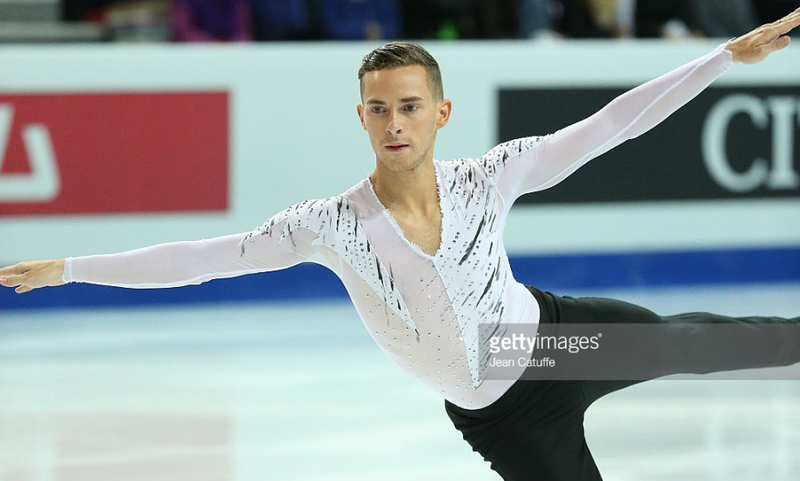 Adam Rippon at the Grand Prix Final in 2016, his last competition before being sidelined by a broken ankle. He returned with encouraging skates at last weekend's Finlandia Trophy. 1. Adam Rippon, the 2016 U.S. champion, had a thoroughly respectable and encouraging showing in his first competition since a broken foot sidelined him before last January’s nationals. Yet his skating at last weekend’s Finlandia Trophy showed again that Rippon, like U.S. teammate Jason Brown, still lacks the big points jumps to be a medal contender in global championships. Rippon finished a very close third overall to Jin Boyang of China and Vincent Zhou of the U.S. mainly because Jin imploded in the free skate and Zhou in the short program. Rippon was second to Zhou in the free skate, but his technical score was 16.12 lower than Zhou’s and 8.58 lower than Jin’s, even though free skate winner Zhou singled an axel and Jin had four under-rotated jumps and two falls. Rippon tried one quad (fell on an under rotated lutz). Zhou got full base value on four quads (three clean). Jin tried four and got full base value on two. And, like it or not, the way the sport is scored today, the points from such jumps are lot to overcome, unless you are Carolina Kostner (see below.) Gaining from others’ imperfections can only take you so far. 2. Chen and Zhou, 1-2 at last year’s U.S. Championships, are nearly sure bets for two of the three U.S. men’s singles spots in the 2018 Pyeongchang Olympics – Chen, 18, for obvious reasons; Zhou, who turns 17 this month, because he also represents the future of U.S. men’s skating and would benefit from Olympic experience. In a subjective selection process with amorphous criteria, that (and Zhou’s ability to land multiple quads) gives him an advantage, should everything else be nearly equal. That would leave Max Aaron, 25, Rippon (28 next month), and Brown (23 in December) in a battle for the final spot. But for trying and cleanly landing his first quadruple loop in competition (and then successfully doing another three weeks later), Chen was unremarkable (by the standard he set last season) in both his Challenger Series win (U.S. International) and his second (by 11 points) to two-time world champion Javier Fernandez of Spain in the Japan Open. But he still is light years ahead of every other U.S. man. Nagasu already has beaten the reigning U.S. champion, Karen Chen, in both their meetings this season and the reigning U.S. bronze medalist, Mariah Bell, in their lone meeting. Nagasu and Bell are scheduled to skate in the same two Grand Prix events: Rostelecom and the NHK Trophy in mid-November. Nagasu will not face three-time U.S. champion Ashley Wagner until nationals, unless both qualify for the Grand Prix Final. 4. Polina Edmunds’ comeback has been so rocky it makes one wonder if she is beating her head against a wall. Edmunds, 19, was U.S. runner-up in 2014 and 2016. An injury had kept her from any competition for 18 months after the 2016 nationals and from a serious competition another two months before she skated at Finlandia Trophy. I realize this is an Olympic year, and an athlete never wants to look back and say, “What if?” Yet Edmunds already has ticked off the Olympic box on her resume, and it is difficult to watch her struggle so badly. She is a long, long way from recapturing the form that allowed her to skate a breathtakingly beautiful short program at the 2016 nationals. 5. As bad as Edmunds was at Finlandia, 2014 Olympic bronze medalist and five-time European champion Kostner of Italy was relatively worse. That Kostner finished second was a testimony to the ridiculous reputational scoring that inflates her program component scores beyond reason. At Finlandia (as in her previous Challenger Series event, Lombardia Trophy), Kostner’s programs had jump content so minimal it would be insufficient for a junior skater. In fact, Kostner’s free skate base value at Finlandia was lower than those of 10 of the 12 women who competed at last weekend’s Junior Grand Prix event in Poland – and the juniors do one fewer element. (It also was lower than that of Edmunds, her falls and under rotations notwithstanding.) Kostner’s short program base value was lower than those of seven of the 12 juniors. I’m beyond tired of the “But she’s a beautiful skater” defense. Senior component scores should also reflect the comparative difficulty of what a skater is doing. Especially if, like Kostner, the skater didn’t even do simple stuff very well. 6. Gabby Daleman of Canada, the reigning world bronze medalist, also had a dismaying season debut at Finlandia, with two falls in the free skate and one in the short program. She was sixth overall. 7. All that stumbling and bumbling makes Evgenia Medvedeva’s consistency even more remarkable. I calculated just how striking it was in a column last May, and she has added to those numbers in finishing first at the Nepela Trophy and Japan Open. *The two-time defending world champion from Russia has not fallen in her last seven competitions (13 programs). That covers 268 jump attempts. Beginning with the 2015-16 season, she has won 13 of her 14 individual competitions. Including results in two team events, she has been first in 13 of 15 short programs and 14 of 16 free skates. Yes, ice is slippery, and anything can happen in Pyeongchang next February. Yet, since the end of compulsory figures in 1990, no woman has been as overwhelming an Olympic gold-medal favorite as Medvedeva, 17, who headlines the women’s field at Rostelecom. And her baby ballerina teammate, senior debutante (and reigning world junior champion) Alina Zagitova, 15, has quickly established herself as an Olympic medal contender. 8. Don’t be surprised if no U.S. woman makes the final free skate group at the Olympics. I imagine that would be a first for any Olympics when the final group comprised the top six in the standings prior to the free skate. 9. And don’t be surprised if the U.S. wins no figure skating medal at this Olympics, a shutout that has not happened since World War II. Dance clearly is the best shot, but you can give two of the medals to Virtue-Moir (CAN) and Papadakis-Cizeron (FRA) right now, and that leaves a lot of good teams fighting for one medal. 10. Saving the best for last: At age 37, after seven years of staying earthbound on skates, Ms. Kwan can still throw down. Check out this video from her Instagram account.